I suppose that if you’re going to revise Heart of Darkness you might as well be up front about it, but you probably don’t want to leave readers wishing you’d shut up about it. The constant explicit nods to Joseph Conrad’s horror taproot text – both as lines remembered by one of the two protagonists, and in the form of regularly interpolated quotations – are, however, the only real problem with Birdbrain, which otherwise is seductively sparing, and almost unbearably precise in its audience ministrations. The stories of two Finns hiking their way across large chunks of New Zealand, mainland Australia and Tasmania, Johanna Sinisalo’s first novel to be translated into English since Not Before Sundown (2000/2003) is a more sombre piece than its predecessor, but no less striking. I didn’t have a problem with my constant trips to the bar: the bloke behind the counter was a fairly decent specimen. He was almost two metres tall, slim with broad shoulders. His eyes were a light-grey colour, and there was a darker circle around his irises that gave his stare an almost paralysing intensity. No ring on his left hand, but he had a large golden earring dangling at the side of his shiny shaved head. The most impressive thing about him was that he never seemed to make a single unnecessary or unconsidered movement. — which sets the structure for the rest of the novel, being largely short segments, alternating between Heidi and Jyrki not quite connecting with each other, and neatly establish the basis of their admittedly intense relationship. An additional layer of structure alternates between two time frames: the one quoted above, which starts in 2006, and one starting in March 2007, with the pair setting out to hike Tasmania’s little-used South Coast Track. It transpires that a few months into their affair, Jyrki, who is pretty much as arrogant as you might have guessed, informed Heidi that he’s finally in a position to go on a long dreamed-of holiday; Heidi, caught somewhat off guard, volunteers to go with him for complicated reasons. It turns out that for her the trip – though not without its rewards – is primarily an ordeal, while for Jyrki – though not without its frustrations – it’s primarily an ideal, a chance to lose himself, and perhaps find himself, in the wilderness. The novel unwinds both timelines and characters over the course of a compact 217 pages, with the South Coast Track the grand finale. Neither character, you sense, quite has the full measure of the landscape that surrounds them. Heidi feels exposed, unnaturally separated from human community and shelter, and convinced that Tasmania is not just alien but a palpable presence that seems to stalk them: “both age-old and fresh as the day it was born […] invisible, smart enough constantly to devise little pranks and childish enough to carry them out” (41). It’s Heidi for whom the raw conditions are most wearing; it’s Heidi who picked up a copy of Heart of Darkness at one of the hostels they stayed in near the start of their journey, and read it half a dozen times, to the point that it seems to inescapably frame her experience. Yet Heidi also sees the trip as a chance to escape the stultifying patronage of her family, to do something “By myself. For myself” (50); and she learns fast, and pretty well. As her experience grows, so too does a much longed-for sense of freedom. Jyrki, meanwhile, finds freedom less in his self than in the absence of others. He is continually frustrated by the difficulty of leaving civilisation behind, by the indulgent lodges, or distant planes, or traces of other travellers, or other impurities of experience. (“Conveniences,” he feels, “are only convenient if you actually want them”, 67.) His arrogance, we come to understand, is rooted in both experience and skill – he is an utterly scrupulous hiker, dedicated to leaving on the land untouched — and in an abiding anger at the violence humans inflict on the world around them, through simple thoughtlessness as much as deliberate rapaciousness. For Jyrki Tasmania is other because humans are pollutants: “No animal in this world,” he argues, “is as unpleasant as one forcing its way outside its natural environment, feeding itself off human was like a parasite” (188). 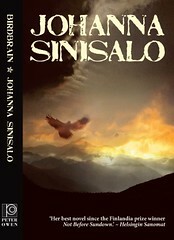 Jyrki’s passion is energising and necessary, and seems to have the novel’s weight behind it. In addition to the two Finns, and Conrad, there are other voices in the novel that shape our understanding of what is happening. The most prominent is nameless (although it may be Heidi’s brother; or there may be more than one nameless), and offers a series of snapshots of urban alienation, each depicting a new vandalism: freezers unplugged in supermarkets; keyed cars; stolen pets; stones dropped from motorway bridges; arson. Almost all we know about nameless is that they’re depressed, sour, callous, and seemingly the embodiment of the worst Jyrki believes about humanity, thoughtless. “It’s not about envy,” nameless says, when trying to explain their actions, they “just want to leave their mark on the world” (98). And what of the world? It is as distinctive a presence in the novel as any of the humans, and it seems to validate Heidi’s viewpoint. As one of the people Heidi and Jyrki meet puts it, sometimes it seems that humans are “just swarming parasites on Mother Earth’s skin, tickling and teasing, irritating and provoking her until the only thing she can do is disinfect herself” (121-2). And as the pair travel into increasingly remote areas, inconveniences become problems, including a series of disturbances that can’t be accounted for, as when Heidi’s water bottle disappears, then reappears several days and a couple of hundred kilometres later. The implied explanation, which is much more obvious to us than to the Finns, not least because it’s more or less given away on the back cover, has to do with a previously undiscovered species of parrot that may be related to the New Zealand Kea, of which a scholarly article notes: “… can solve even complicated problems with relative ease. […] This behavioural pattern becomes more common when food is in greater supply” (109). This sounds cartoonish but is not: and in fact the novel’s sharp climax gains, the final epiphanic revelation of its own heart of darkness, gains part of its potency from the thoroughness with which cartoonishness is disavowed. And the rest of the novel is grounded by Sinisalo’s crisp descriptions. Birdbrain is very obviously and forcefully an environmentalist novel; but it is also simply a brilliant piece of writing about the environment. From the fire-scorched Grampians national park in Australia (“the clumps of grass stood out so vividly against the pitch-black ground that they looked as though they had been lit up from the inside”, 120) to the magisterial Ironbound range (“A primordial forest hanging on the edge of bottomless gorges, set right in the middle of a giants’ game of skittles”, 115), the landscape seems always confidently distinctive; as Heidi puts it early on, perfectly aware of its own qualities and without the need to please anyone. That the corruption of humanity may have produce a corruption in the ecology of this land, even a counteracting one, is a deeply felt tragedy – one that springs from a bleak and partial view of humanity, but one that provides a rich seam for this elegant, severe novel to mine.